You can shop the CeraVe range across Boots stores Nationwide. You will find us in the healthcare aisle, located near the pharmacy section. CeraVe is also available across selected independent pharmacies Nationwide. Yes. CeraVe samples are often distributed through our online sampling campaigns. Please be sure to "LIKE" us on Facebook to learn about the latest CeraVe products and promotions. Does the UK Stock the PM Moisturising Lotion? If you have previously used the PM Moisturiser you should try the Facial Moisturising Lotion which is the same formula, except for the preservative system (parabens have been removed in the European formula). You will have the same skin benefits as you did from the PM Moisturiser. Is the CeraVe range suitable for children? We can confirm that the CeraVe range is suitable for children aged 3 years and above. Is the AM moisturiser and the SPF 25 Facial Moisturising Lotion the same? The US AM Moisturiser has SPF 30 vs. the Moisturising Lotion which has SPF 25. The approved sun filters used in the US and Europe are different and therefore the European lotion uses a different filter system vs. the AM Moisturiser (you may notice this as a slight change in texture). However, it has the same level of ceramides and skin benefits as the US AM Moisturiser. Why are the ingredients on my EU pack in another order than in the US? As we introduce CeraVe to new countries some of their regulations on packaging and labelling will vary. However, level of ceramides is the same in all formulas, but listed in a different order. Rest assured, CeraVe products in the UK will have the same skin benefit as the ones in the US. To understand your skin barrier better, think of your stratum corneum (the skin barrier) as a brick wall-like structure. It is comprised of corneocytes (bricks) held in place by intercellular lipids (mortar). These intercellular lipids are composed primarily of 50% ceramides, 25% cholesterol and 10-20% fatty acids. Over time, the depletion of ceramides can result in moisture loss, dryness and cracking and/or inflammation and irritation from allergens and toxins on the skin barrier. 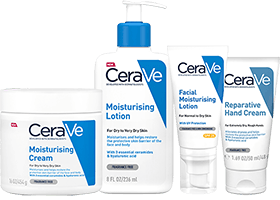 Are CeraVe products suitable for eczema prone skin? The CeraVe range is suitable for eczema prone skin. We recommend you try the Moisturising Cream. Are CeraVe products suitable for psoriasis? The CeraVe range is suitable for those who suffer from skin prone to psoriasis. We recommend you try the Moisturising Cream. All CeraVe products are enriched with three essential lipid molecules – ceramides 1, 3 and 6-II. These three help restore a healthy skin barrier and block out external aggressors that irritate your skin. The CeraVe range is also developed with a patented technology known as MVE (Multi-Vesicular Emulsion). This gradually releases the ceramide-enriched formula over 24 hours, providing long-lasting hydration to the skin. In 2005, researchers in the U.S. partnered with leading dermatologists to develop the CeraVe brand - a line of skin care products designed to help repair and strengthen the skin barrier. Experts understood that the skin barrier serves an important function in promoting healthy skin and that key components of the skin barrier (ceramides) are deficient in compromised skin conditions. No, CeraVe products are not tested on animals and they are cruelty free. Yes, the CeraVe UK range of products are non-comedogenic, so they won’t clog pores or cause acne. All CeraVe products are fragrance-free and non-irritating. Yes, the UK CeraVe range is Vegan. Our products contain no animal derived products. MVE stands for MultiVesicular Emulsion technology and is a patented delivery system. Unlike convertional delivery systems, MVE technology continuously releases the ceramide enriched formula throughout the day for 24h hydration and improved results. 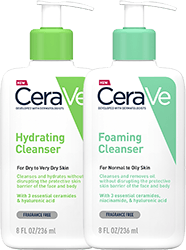 Which CeraVe products can I use on my face? Or which can I use on my body? CeraVe can be used on face and body, with some products specially formulated for each. The ingredient list for each CeraVe product is displayed on its packaging and on its product page, under the “Ingredients” tab. CeraVe products are non-irritating, fragrance-free and non-comedogenic. If you are sensitive to a particular ingredient, or have any other concern, we suggest that you consult your GP or a dermatologist.